The news is out! TpT IS having a sitewide SALE on Monday and Tuesday this year! These types of sales only happen 4 times a year and boy let me tell you these are the best days EVER! Most sellers discount their stores 20% and then TpT offers another 10% off and it a great time to clean out that wishlist! I participate in each of these SALES and also include my bundles in the 20% off so if you purchase one of my bundles during the sale you get 50%off!!!! I am linking up with Teaching in the Tongass to show you the most wishlisted items from my own store, who knows it may be just what you have been searching for! Up first is my QR Code Bundle! 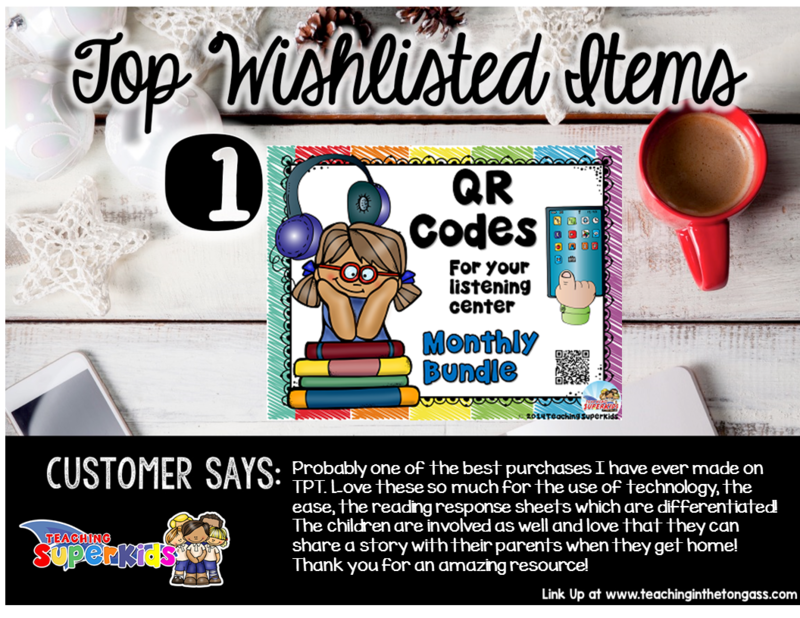 This bundle seriously has everything you need to create an awesome Listening Station that will keep your little learners engaged and active. One thing about this set that is unique is that it includes 2 differentiated student response sheets for each story. The first sheet gives them the opportunity to color and draw something in the box related to the story. The questions always relate to the story they listen to. The next sheet is for those who are writing, it always asks them something related to the story or asks them to relate to the text. The best part of the student response sheet is that the QR code is included, so once they are done they can take the sheet home and share the story with mom and dad! Another feature that I always include on my QR codes is a clickable option. I know not every classroom has access to iPads/tablets but most classrooms have a least one computer and as long as you have internet on that computer you can actually pull the PDF up and have the students click on the QR code instead! The 2nd most wishlisted item in my store would be my Number of the Day Posters! These are perfect for use during calendar time. Number of the Day activities can build greater number sense for your students and get them warmed up for more! The posters themselves are colorful and you can pick and choose which skills to work on. Switch it up! All you need to do is pick a number and then showcase the many different ways you can use and represent that number. There are response sheets as well with this set. I have even added some additional math reference sheets that you can copy for student folders. The 3rd one is a relatively new one to my store but it has had some very nice reviews on it! It is my Write the Room bundle. Everyone knows that kids need to move. This set of Write the Room cards offers you that opportunity. You can hide the cards around the room and the students take their sheet and clipboard and fill in the sheet. Each monthly themed set comes with 3-4 weeks of Write the Room cards that have a set of 3 differentiated activities, the traditional write the room fill in the blank, a crossword and a fill in the sentence sheet. I have also extended the learning by adding in a set of high frequency word cards and picture cards that can be used in a pocket chart to create their own sentences. There are handwriting sheets included for this activity. It really was always my students favorite activity to do in the classroom. If you are limited on space you can always add the cards to a basket or ring and set up in your writing area so they are versatile. I hope that whatever items are on your wishlist this season that you and your kids are blessed and that you enjoy your time together! Don’t forget to enter the code at check out to get your extra 10% off! If you liked to link up too visit Teaching in the Tongass for more information!